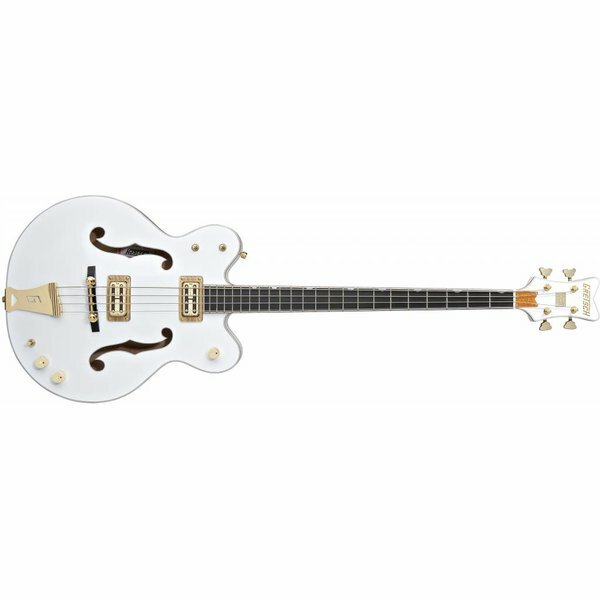 This gorgeous top-of-the-line Gretsch bass is modeled on the classic White Falcon guitar. The double-cutaway body has an arched top with oversized bound F Holes, gold-sparkle binding and white back pad. Other features include a three-piece maple neck, ebony fingerboard with mother-of-pearl Neo Classic "thumbnail" inlays, dual TV Jones Thunder'Tron humbucking bass pickups, three-position pickup switch, three-position master tone switch, standby switch, Space Control bridge, "G"-cutout tailpiece, gold-plated Gotoh locking tuners and gold-plated hardware.